We’ve all seen them at one time or another in our lives. Maybe your mother used one, maybe your grandmother used one, or maybe you’ve seen a recipe that called for one but you weren’t too sure what it was or how it worked. They’ve been a part of the American cooking scene for years, and they’re still very relevant in today’s most popular dishes. They haven’t been in the news for good reasons as of late, but they are of use for good in the kitchen. Of course, I am talking about the pressure cooker. If you’re considering purchasing a pressure cooker, and you want to know what the best pressure cooker is for your specific needs, you’ll first need to ask yourself a few questions: What is your budget? What foods would you like to cook? How experienced are you in the kitchen? Will you be using this for just pressure cooking, or would you like to have one that serves another purpose? Once you answer those questions, you’ll be well on your way to deciding on which pressure cooker is best for you. Before we show you a list of pressure cooker’s, let’s first look at some of the reasons you should purchase a pressure cooker, and some things to be aware of before you do. The pressure cooker was developed in 1679 by a French physicist named Denis Papin. Papin studied steam engines, and wanted to develop a cooking device with steam engine principles. His device worked, but wasn’t brought into the mainstream until 200 years later. A pressure cooker is a very simple device with a myriad of uses in the kitchen, and its design is very straight forward. 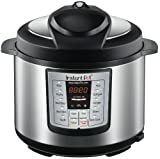 A pressure cooker cooks food pretty much the way you would expect it to: by using water, oils, or cooking fluid in a sealed metal pot that does not allow air to leak in or out, which in turn heats the liquid up at a rapid speed. Once the compressed air heats up the liquid, it allows the food to cook very quickly. It uses the wet steam that permeates inside the pot to penetrate the food and cook much more efficiently than standard cooking practices alone. A pressure cooker cannot be used to do things like pan fry or roast, but it does have a lot of versatility many folks aren’t aware of. In fact, Kentucky Fried Chicken uses a pressure cooker to fry its chicken because the cooker reduces cooking time dramatically. Usually, a pressure cooker is not good for frying because the oils cannot produce the amount of steam needed for the pressure cooker to work, but what Kentucky Fried Chicken does is allow its chicken to provide the water needed create the steam that’s needed to cook. That’s why you see that Kentucky Fried Chicken offers traditional fried chicken, and extra crispy chicken on its menu. Traditional is cooked in the pressure cooking fryer where the breading is a little moist because of the steam used to cook it, whereas the extra crispy is nothing more than deep fried in a traditional fryer at very high temps. 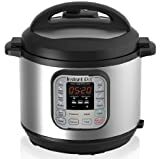 Pressure cookers can cook things faster than just about any method other than some microwaveable dishes, which are almost always pre-cooked and just use the microwave to heat the food up. A pressure cooker can cook things like a pot roast in an hour. Anyone who knows what a good tasting pot roast tastes like knows you usually have to leave it in the crock pot when you leave for work so it will be ready when you get home. This is the kind of food that a pressure cooker was made for. It can cook a traditionally long dish in the amount of time it takes to make a normal dinner. It’s also great for making things like chicken soup, beef stew, potato salad, and just about anything else that doesn’t exclusively require frying. Because the pressure cooker does just that, cooks with high heats at high pressures, it can be a dangerous if you don’t know what you’re doing. Some of the old pressure cookers were dangerous and back in the 60’s and 70’s there were some incidents of people not fastening the tops correctly, or not removing them correctly, and the cookers “blew up.” A lot of the time that was because the old devices only had one primary safety valve that could get blocked from food being stuck in it, hence the reason some folks thought it was safe to remove the lids when it actually wasn’t. Today though, the devices are heavily regulated and those incidents are few and far between, and with most devices it’s almost impossible for them to cause you any harm. There will always be a large amount of steam permeating from the cooking device, so you’ll want to be careful when opening it no matter what, but they are safe to use, and once you get used to them it will seem like no big deal. We’ve got a list of seven great pressure cookers in the grid below for you to check out if you’re considering purchasing one. Happy cooking!